matmarex moved T219457: Opening VisualEditor in a disabled namespace with 2017 wikitext editor enabled displays raw Parsoid HTML from QA to Product owner review on the VisualEditor (Current work) board. matmarex moved T219457: Opening VisualEditor in a disabled namespace with 2017 wikitext editor enabled displays raw Parsoid HTML from Code review to QA on the VisualEditor (Current work) board. matmarex triaged T221128: Wikibase / CirrusSearch tests are blocking merges in Math extension as Unbreak Now! priority. matmarex added a comment to T220011: Show anonymous/blocked editor prompts for VE mobile as well as wikitext mobile editors. matmarex merged task T220922: Give a clearer message when a mobile edit fails because of spam blacklist into T167078: Spam links trigger unknown error on mobile. matmarex merged T220922: Give a clearer message when a mobile edit fails because of spam blacklist into T167078: Spam links trigger unknown error on mobile. matmarex merged T184978: Header bar overlaps save button in Visual Editor into T183284: Timeless and VE media insertion dialog conflict. matmarex merged task T184978: Header bar overlaps save button in Visual Editor into T183284: Timeless and VE media insertion dialog conflict. matmarex added a comment to T184978: Header bar overlaps save button in Visual Editor. This has been resolved by the same fix as T183284. matmarex edited projects for T221042: Got "TypeError" when searching with prefix: in the Spanish Wikipedia, added: CirrusSearch, Wikimedia-production-error; removed MediaWiki-General-or-Unknown. matmarex added a comment to T220792: LookupElement has padding at the end if there is just one suggestion. I think this might be a problem with all dropdown menus – for some reason MenuSelectWidget has a min-height in its styles. matmarex added a comment to T220984: Visualeditor/Parsoid in Internet Explorer scrambles Texts. I can reproduce this on Windows 10 as well. The problem happens when typing with a "table selection" (blue overlay covering a table cell); it doesn't happen when typing with a "linear selection" (blinking cursor inside a table cell). matmarex closed T220916: ve is apparently writing cs1|2 templates with invalid parameters as Invalid. VisualEditor uses parameters as defined in the template's TemplateData. This parameter is documented in https://en.wikipedia.org/w/index.php?title=Template:Citation/doc&action=edit and neither the JSON data nor the human-readable description mention any restrictions on its use. If you want Citoid to stop using it, you should delete this line from it: "issueDate": "issue-date",. matmarex added a comment to T220671: Replace `em` based sizing in favor of `px` based. matmarex moved T218635: Mobile visual editor scrolls to the top of the page after adding a link in iOS Safari from Stalled/Waiting to Product owner review on the VisualEditor (Current work) board. matmarex added a comment to T218635: Mobile visual editor scrolls to the top of the page after adding a link in iOS Safari. I'm not familiar with that problem, and I don't recall any relevant tasks… I would prefer if we filed a separate task for it. matmarex closed T72803: FOUC on signup page where CAPTCHA is in the wrong place before moving down as Resolved. matmarex added a subtask for T110413: Relative links to subpages are treated as links to the mainspace that start with / until after saving: T221028: Parsoid incorrectly parses links to pages starting with a slash '/' in namespaces that can have subpages. 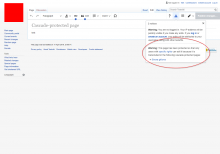 matmarex added a parent task for T221028: Parsoid incorrectly parses links to pages starting with a slash '/' in namespaces that can have subpages: T110413: Relative links to subpages are treated as links to the mainspace that start with / until after saving. matmarex added a comment to T110413: Relative links to subpages are treated as links to the mainspace that start with / until after saving. Typing "/Sandbox" into the link inspector shouldn't create a link to the "Sandbox" subpage of the current page. It should create a link to the page "/Sandbox" in the main namespace. We do not support any other relative link syntaxes supported by MediaWiki (e.g. try "../Sandbox", it refuses to accept it, but [[../Sandbox]] is a valid link in wikitext). matmarex created T221028: Parsoid incorrectly parses links to pages starting with a slash '/' in namespaces that can have subpages. matmarex closed T115089: Template/reference preview of links is relative to current page, not the correct base, until saved as Resolved. This no longer seems to be a problem. matmarex moved T154622: Hidden HTML comments are in very light grey and hard to read from Ready for Pick Up to Product owner review on the VisualEditor (Current work) board. matmarex moved T154622: Hidden HTML comments are in very light grey and hard to read from Unsorted to Colors on the Accessibility board. matmarex changed the status of T154622: Hidden HTML comments are in very light grey and hard to read from Stalled to Open. matmarex added a comment to T154622: Hidden HTML comments are in very light grey and hard to read. matmarex edited projects for T208102: Improve compatibility of desktop VisualEditor with desktop Minerva skin, added: MinervaNeue (Desktop); removed MinervaNeue. matmarex added a parent task for T220781: When filtering page history by date, the older/newer paging links don't work: T107069: Convert HistoryAction.php to use OOUI and MW's new DateInputWidget. matmarex claimed T220781: When filtering page history by date, the older/newer paging links don't work. matmarex added a subtask for T107069: Convert HistoryAction.php to use OOUI and MW's new DateInputWidget: T220781: When filtering page history by date, the older/newer paging links don't work. matmarex created T220781: When filtering page history by date, the older/newer paging links don't work. matmarex added a comment to T220555: Evaluate collapsible form on HistoryAction (collapsed by default?). @Volker_E I'm not an expert and may be wrong/out of date, but aren't there either accessibility and mobile issues with collapsing? I vaguely recall DJ putting a lot of work in on that front. matmarex added a comment to T107069: Convert HistoryAction.php to use OOUI and MW's new DateInputWidget. I really liked this change because of the ability to pick a concrete date, but the interface clearly wasn’t fledged out. Collapsing the form now seems not like a complete fix of the design, but like a quick and dirty change to appease people. This is especially visible on the screenshots provided here, where OOUI clearly doesn’t support collapsing forms like this and bottom margin is still visible in collapsed view. matmarex added a subtask for T190765: Refreshing a source page in the 2017 wikitext editor switches back to one of old editors (when VisualEditor is temporarily disabled): T209163: Loading an edit page using veaction=edit in single-tab mode changes URL to an incorrect state. matmarex added a parent task for T209163: Loading an edit page using veaction=edit in single-tab mode changes URL to an incorrect state: T190765: Refreshing a source page in the 2017 wikitext editor switches back to one of old editors (when VisualEditor is temporarily disabled). matmarex added a comment to T190765: Refreshing a source page in the 2017 wikitext editor switches back to one of old editors (when VisualEditor is temporarily disabled). I think this might be caused by T209163: Loading an edit page using veaction=edit in single-tab mode changes URL to an incorrect state. We should revisit this task after that is fixed. 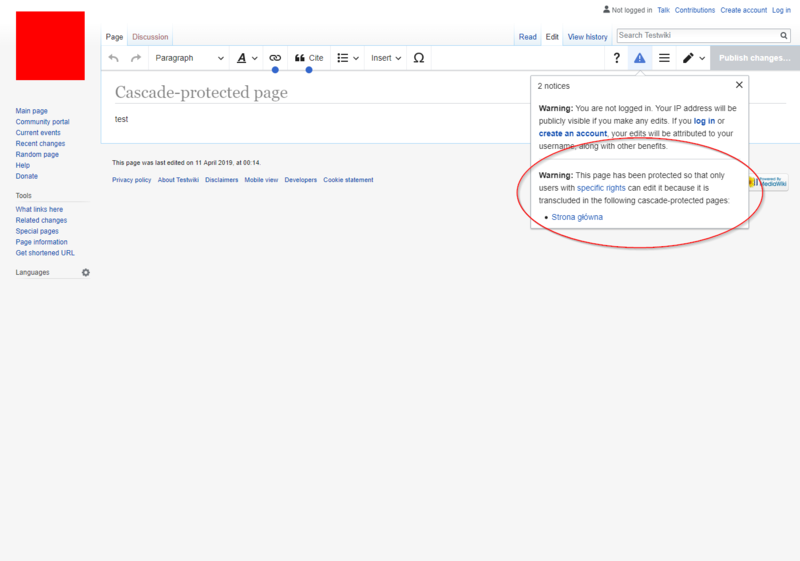 matmarex added subtasks for T190989: On the desktop site, editing the lead section of a page under MinervaNeue skin directs a user to one of desktop WikiEditors: T178976: When VE is disabled but NWE is enabled and wiki is in multi-tab mode, initialization code for the "Edit" tab doesn't run, T190765: Refreshing a source page in the 2017 wikitext editor switches back to one of old editors (when VisualEditor is temporarily disabled). matmarex added a parent task for T178976: When VE is disabled but NWE is enabled and wiki is in multi-tab mode, initialization code for the "Edit" tab doesn't run: T190989: On the desktop site, editing the lead section of a page under MinervaNeue skin directs a user to one of desktop WikiEditors. matmarex added a parent task for T190765: Refreshing a source page in the 2017 wikitext editor switches back to one of old editors (when VisualEditor is temporarily disabled): T190989: On the desktop site, editing the lead section of a page under MinervaNeue skin directs a user to one of desktop WikiEditors. matmarex added a comment to T190989: On the desktop site, editing the lead section of a page under MinervaNeue skin directs a user to one of desktop WikiEditors. matmarex added a comment to T220042: Visual editor (source editing mode) should always present edit summary box before saving. matmarex added a comment to T217217: Visual editor and 2017 wikitext editor mishandle cascading protection. matmarex added a comment to T219848: MobileFrontEnd detects wrong protection level, causing the edit workflow to dead end. I'm guessing this is a bug for VisualEditor project but let me know if that's not the case. matmarex added a comment to T191823: No toolbar on mobile views using Firefox and Chromium. Nevertheless, after recently re-testing a page by using the MinervaNeue skin, the issue is already fixed (or nearly fixed). Well, if the 2017/Newer Wikitext beta editor is not enabled, the gadget (if enabled) and one of the pencil icons would result the same. Nevertheless, the word "edit" button would appear next to the article title. matmarex moved T219680: Diff view goes empty while switching back Visual diff to wikitext diff from Ready for Pick Up to Code review on the VisualEditor (Current work) board. matmarex claimed T219680: Diff view goes empty while switching back Visual diff to wikitext diff. matmarex moved T219457: Opening VisualEditor in a disabled namespace with 2017 wikitext editor enabled displays raw Parsoid HTML from Ready for Pick Up to Code review on the VisualEditor (Current work) board. matmarex claimed T219457: Opening VisualEditor in a disabled namespace with 2017 wikitext editor enabled displays raw Parsoid HTML. matmarex added a comment to T219627: Sometimes an ISBN turns up wrapped in nowiki-tags. I argued for this to be put in "Needs Discussion/Analysis" rather than "Freezer", but on a closer look, I agree with Ed – I'm not sure if this case is worth investigating. I think what I really wanted to discuss was T162291 (nowiki around ISBN caused by copy-paste of large blocks, e.g. copying citations from read mode). matmarex added a comment to T220481: Reenable l10update in production. Note also T158360 which proposes that LocalisationUpdate should be undeployed. matmarex updated the task description for T220629: Right click to delete across paragraphs in Firefox results in no model transaction. matmarex added parent tasks for T145604: [RfC] Future of magic links: T162291: Autolinking for URLs and magic links (ISBN etc.) not applied when copy-pasting a block of text, T219627: Sometimes an ISBN turns up wrapped in nowiki-tags. matmarex added a subtask for T162291: Autolinking for URLs and magic links (ISBN etc.) not applied when copy-pasting a block of text: T145604: [RfC] Future of magic links. matmarex added a subtask for T219627: Sometimes an ISBN turns up wrapped in nowiki-tags: T145604: [RfC] Future of magic links. matmarex merged T217187: VisualEditor adds nowiki-tags around ISBNs into T162291: Autolinking for URLs and magic links (ISBN etc.) not applied when copy-pasting a block of text. matmarex merged task T217187: VisualEditor adds nowiki-tags around ISBNs into T162291: Autolinking for URLs and magic links (ISBN etc.) not applied when copy-pasting a block of text. matmarex added a comment to T192049: Tools column responsiveness with VE Context tools minimum width . This should no longer be a problem after T188823, which allowed the context item labels to wrap. matmarex added a comment to T104540: Reference list <div> can overlap a template <div> because that's how HTML works. This task had recent discussion. matmarex renamed T214543: Recovery of edits after a crash not working in some cases from Feature: Recovery of edits after a crash to Recovery of edits after a crash not working in some cases. matmarex added a comment to T220154: Leading spaces can be hard to see. I don't think there is anything we could do to improve this? matmarex added a comment to T220264: VisualEditor: RTL typing is not working in Urdu. I can reproduce this issue even when typing Latin characters with input methods disabled! matmarex added a comment to T220152: Adding a new line causes the next to be struck out. Per @Schnark I think this is the expected behavior. matmarex added a comment to T220319: Do not let the visual mode break tables. The problematic edit that started these problems is this one which introduced a HTML table row which eventually led to these series of issues. Not sure what caused HTML to be introduced there. My guess is that it was a copy-paste that caused it to serialize as HTML. matmarex merged task T52395: VisualEditor: Phantoms can be width:100% when the object they're meant to cover has a floated element alongside it into T104540: Reference list <div> can overlap a template <div> because that's how HTML works. matmarex merged T52395: VisualEditor: Phantoms can be width:100% when the object they're meant to cover has a floated element alongside it into T104540: Reference list <div> can overlap a template <div> because that's how HTML works. matmarex added a comment to T103635: Stop the user from adding a langlink when we think they wanted to insert an interwiki instead. matmarex added a comment to T218436: Differences between read mode and edit mode on mobile: inconsistent underlines under top-level heading. No, the underlines come from Minerva (or MobileFrontend) styles related to your section collapsing feature. matmarex moved T209162: [Regression] Blockquotes can't be edited, because they're alienated content from In progress to Code review on the VisualEditor (Current work) board. matmarex moved T208826: Toolbar and toolbar dialogs (e.g. special characters tray) unexpectedly become disabled after clicking on page title from Code review to QA on the VisualEditor (Current work) board. matmarex moved T219813: VE article editor should never have a NullSelection from Code review to Product owner review on the VisualEditor (Current work) board. matmarex moved T109508: Mobile VE: Consider providing a visible or larger area for CE when editing an empty page/creating a new page from Code review to QA on the VisualEditor (Current work) board. matmarex moved T219200: [Regression wmf.23] Viewport sometimes jumps to the top abruptly on mobile VE from Code review to QA on the VisualEditor (Current work) board. matmarex added a comment to T219200: [Regression wmf.23] Viewport sometimes jumps to the top abruptly on mobile VE. When can we have the fix for it on Beta cluster? matmarex moved T220158: Avoid wgVisualEditorToolbarScrollOffset data export on page views from Ready for Pick Up to Product owner review on the VisualEditor (Current work) board. matmarex edited projects for T220158: Avoid wgVisualEditorToolbarScrollOffset data export on page views, added: VisualEditor (Current work); removed VisualEditor. matmarex updated subscribers of T220239: Unable to interact with ButtonSelectWidget using keyboard. At a glance, this might be caused by rGOJUcfaea5347d69: SelectWidget: Allow multiselect mode, add to MenuTagMultiselectWidget. Mill <mill@mail.com> committed rECOS584586d0658f: 33baaaaaaaaaaa (authored by matmarex). matmarex moved T219829: De-activated selections should be visually distinct from Code review to Product owner review on the VisualEditor (Current work) board. matmarex added a comment to T219813: VE article editor should never have a NullSelection. I think https://gerrit.wikimedia.org/r/c/mediawiki/extensions/VisualEditor/+/500757 is also necessary to complete this fix? matmarex moved T76426: Blockquotes aren't ContentBranchNodes in reality, and our code shouldn't try to insist that they are from In progress to Code review on the VisualEditor (Current work) board. matmarex added a comment to T76426: Blockquotes aren't ContentBranchNodes in reality, and our code shouldn't try to insist that they are. The patches now only resolve the technical issue of multi-paragraph blockquotes not being editable. I'll file a separate task to consider the toolbar changes later. matmarex moved T206357: Self-XSS in VisualEditor link context menu from Code review to Product owner review on the VisualEditor (Current work) board. matmarex moved T107745: Come up with an alternative to having multiple slugs (invitations to add a paragraph) next to each other that preserves editing capabilities from Code review to QA on the VisualEditor (Current work) board. matmarex renamed T219949: PopupButtonWidgets should have real popups in PHP, not only "title" tooltips from Popups stopped working in PHP to PopupButtonWidgets should have real popups in PHP, not only "title" tooltips. matmarex moved T206357: Self-XSS in VisualEditor link context menu from Engineering QA to Code review on the VisualEditor (Current work) board. This is the followup/hardening change I proposed here earlier. matmarex awarded T193731: CheckboxMultiSelect- & RadioSelectWidget changes vertical spacing when infused a Party Time token. matmarex moved T219916: Deactivated selection out of position when window resized from Code review to Product owner review on the VisualEditor (Current work) board. matmarex added a comment to T219949: PopupButtonWidgets should have real popups in PHP, not only "title" tooltips. matmarex added a comment to T97891: setPageTitle to empty string or false should prevent rendering of H1 on page otherwise Wikivoyage will print 2 h1 elements in Vector. matmarex moved T208981: Reference context doesn't show that the reference is reused, which is confusing if you try to delete and recreate it (converting a re-used basic reference to template citation) from Code review to In progress on the VisualEditor (Current work) board. The main patch for this change (https://gerrit.wikimedia.org/r/c/mediawiki/extensions/Citoid/+/483337) is not merged yet, so none of the UI changes described above have happened. matmarex moved T219562: VE doesn't let you enable it in namespaces whose labels happen to be ints from Code review to Product owner review on the VisualEditor (Current work) board. matmarex moved T219916: Deactivated selection out of position when window resized from Ready for Pick Up to Code review on the VisualEditor (Current work) board. matmarex moved T103635: Stop the user from adding a langlink when we think they wanted to insert an interwiki instead from Freezer to To Triage on the VisualEditor board. matmarex added a parent task for T95850: Parsoid does not escape language prefixes in internal link hrefs, causing html2html round-trip failures: T103635: Stop the user from adding a langlink when we think they wanted to insert an interwiki instead. matmarex added a subtask for T103635: Stop the user from adding a langlink when we think they wanted to insert an interwiki instead: T95850: Parsoid does not escape language prefixes in internal link hrefs, causing html2html round-trip failures. matmarex updated subscribers of T95850: Parsoid does not escape language prefixes in internal link hrefs, causing html2html round-trip failures. I actually kept digging a bit more. I blamed these lines to find where they came from.